The option for 108 vehicles on the Bombardier order for 387 stock has been exercised today, with them forming the new Gatwick Express fleet. So any thought that this could have been used to provide services for the Thames Valley has been dashed. Though I guess there is still the possibility that the first tranche under the option could head our way once the Thameslink stock is in service. With this order commencing delivery in Dec 16, it's clear that any new build is very unlikely to be in service by the time the wires go live given the lead time for a new tender. The 387/1s are supposed to become available during the latter part of 2016 now don't they, as 700s appear in service from the early part of 2016? I read somewhere that by the end of 2016 there should be one 700 per week arriving, and they only need about 15 units of 8 or 12 cars to replace the 387/1 batch after all. A lot depends on the exact plan to replace the existing Thameslink units, I (and I reckon many others) originally assumed that all the 387/1s would remain until all the 319s had left, - but that might no longer be the case. In other words 387/1s could leave Thameslink while they are still using a few 319s. As the 387/1 are already in use, transferring them to another route should be achievable fairly quickly. I thought the possiblity of 387s for Great Western was more-related to where the first batch would be cascaded when the 700s arrive, rather than the 108 vehicle extension order. I suppose the question is whether the 29 units is enough for the Thames Valley. Can't help noticing that the new GatwickExpress Fleet (108 vehicles) is smaller than the current one (120 vehicles). Less work to Brighton for the new Gatwick Fleet? But then again, I've always understood refreshed 319s were coming to the TV, and haven't seen anything other than rumour that they aren't. Having said that, it'll be down to FGW to lease whatever they can get, I guess. That'll form part of their bid for the 5-year award coming up. The new fleet will almost certainly be more reliable than the 442s, allowing greater '%age' utilisation anyway, and the few 442s used on other non Gatwick/Brighton services, i.e. the Eastbourne to London Bridge peak extras will probably revert to normal 377 operation in the overall stock shakeup. Even if they only binned the Eastbournes that would be 10 vehicles no longer needed. Think they've got confused. It's the 387/1's for Thameslink that are being introduced in 2015, the DfT press release definitely says the 387/2s will be introduced in 2016. As an aside, it's more good news for Bombardier. Whilst 108 cars isn't a massive order, it's a nice little add-on to the existing one. I'll have a cheeky fiver with anyone that 319s will not come to the Thames Valley routes for anything other than a short stop-gap period, or possibly as a small fleet to work the branches after Crossrail. Network Rail's statements that they feel 110mph capable EMUs are needed to make best use of the newly electrified routes (which counts as more than a 'rumour' I feel). The prestige of the Oxford to London route meaning that more modern stock would be more suitable than 30 year old units. The original Class 319 statement was made many years ago and the electrification strategy has moved on considerably since then, particularly with regard to extensions to the programme in the North West, which would probably use up the entire 319 fleet in an area where 30 year old trains would not be considered a backward step from what is currently provided. The 387s needed post-Crossrail would indeed be roughly the 29 units that Rhydgaled mentions to cover what will be needed by FGW. Paul is quite right that it might be 387s that are released from Thameslink routes before the 319s as the new 700s appear on stream. 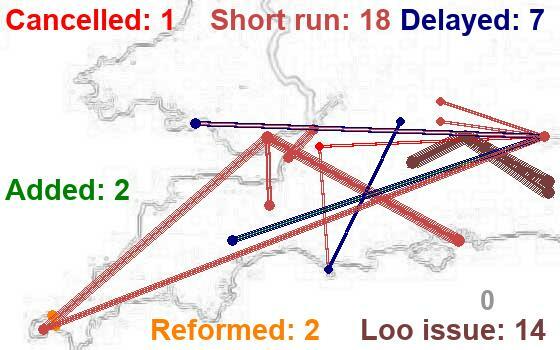 What I can see possibly happening is a short-term usage of the 319s to cover the period between electrification, and the gradual cascade of Turbo units, to when the full Crossrail integration starts in 2019 as more electric units will be required during that interim period for the Reading to London suburban services - they could then move on to the Thames Valley branches, Basingstoke's and Banbury's after Crossrail services start. I can also see the Turbos (or at least some of them) staying a bit longer than is currently planned to wait for those electric units to become available. I might be wrong of course and time will tell. I agree that in the longer term EMUs with a better performance than the 319s will be needed to maximise track capacity. However, it was reported several months ago, after the franchise was extended, that fGW were told by the DfT to stop work on procuring such trains. My impression then was that we were were going to be lumbered with the things but I've since changed my mind. It may well be that the forthcoming Direct Award to fGW to continue operating the Western will permit, encourage or require that fGW starts procurement of more suitable trains. My reasoning is that the franchise extension is a continuation of the status quo, whereas the Direct Award is a new contract with different T&Cs and such requirements can be included. If the new Direct Award franchisee is as fast off the mark as the new Scotrail franchisee in ordering new trains there might be a fighting chance of getting new outer suburban EMUs into service at the same time, or shortly after, the 800s start running in 2017. This is unfair - but although they have a 100mph top speed that still leaves a 25mph speed differential between them and the HSTs and Class 800s. In view of the greater acceleration of the 800s compared to the HSTs, that means that using 319s will cost at least one and probably nearer two paths between Reading and Paddington (and vice versa) on the Mains. Medium term, i.e., post Class 800 introduction, outer suburban EMUs with more oomph and swoosh will be needed. Would only increase the journey time between Paddington and Reading by 5 to 6 mins but less bunching of trains results in better timekeeping anyway so the extra time probably wouldn't be noticed by many people (including me) .....and how many times have you recently arrived 'on time' at Reading or Paddington. Hmm! Spend ^4 billion on new IEP/SET trains in order to be able to travel as quickly as a Class 52 on 12...? I must admit that my memory is getting hazy in my old age, but I can't remember when the 0803 or 0815 ex Twyford last ran to time.